One of Scarlet Heroes‘ biggest changes from standard OSR gaming rules is the introduction of traits. Traits are intended to assume all the functions normally covered by skills in other games, along with adding more distinction and mechanical variety to the classic four-class character generation system. A trait is a brief phrase describing something about the hero’s background, relationships, or innate qualities. “Escaped mine slave”, for example, or “Constantly watchful”, or “Drunken ex-guardsman”, or “Friend to a city magistrate”. Traits are measured on a scale of 1 to 3, with more points indicating more investment and importance in that quality. Every hero gets three points to spend on traits at the start of the game, plus a couple more to reflect certain racial abilities or native aptitudes if playing a demihuman. Traits don’t come with explicit mechanical effects. You may have a “Tireless endurance: 3” but it doesn’t give you a hit point bonus. Instead, they’re cues for the GM to let them know what your hero is good at, and the kinds of things they should automatically be able to do without a roll. If your character is a Pirate: 3, then she should be able to handle a boat, drink bad rum, clamber over rigging, and identify port-city fences without having to strain herself. The only time she should be rolling her Pirate trait is when she’s pulling off some feat that would challenge even an exceptionally salty dog. For occasions of greater difficulty, traits are used in conjunction with checks. Whenever the hero wants to accomplish something unusually difficult, they roll 2d8, add their highest relevant attribute modifier, and add their highest relevant trait. If the total is equal or greater than the check’s difficulty, they succeed. If it’s less, then things don’t work out so smoothly for the hero. Checks take the place of many of the sub-systems found in classic OSR mechanics. Bending bars/lifting gates is a check. Saving throws are checks, albeit with the character’s level added too. Even thief skills are checks, though that ties into the thief class’ special ability. The thief class provided in Scarlet Heroes is something of a catch-all class meant for those heroes who rely on guile and expertise more than sorcerous power or heavy weaponry. At first level, a thief picks a trait to be their archetype. It might be something as straightforward as “Adventuring Thief” with the classic OSR bundle of abilities, or it might be “Academic Tomb-Robber”, “Grizzled Woodsman”, “Streetwise Guard Captain”, or any other archetype that suits. The thief automatically gets 3 points in that archetype- and each time they advance a level, that focus gains one more point, even above the usual trait cap of three points. It doesn’t take long before that thief-hero is getting bonuses of +5 or +6 in their specialty, while other stealthy heroes are limited to +3. Thieves rapidly become almost supernatural in their talents, capable of overcoming challenges and beating difficulties that other classes would have almost no chance of handling. In Scarlet Heroes, if a master thief wants to infiltrate the Temple of the Frog, the Temple of the Frog is going to get infiltrated. The question then is what the thief is going to do once he’s inside. Together, traits and checks are meant to streamline things for the GM and player while still giving the hero some mechanical distinctions from others of the same class. For some people, it’s always been enough to just decide that your fighter was a blacksmith’s son and let it go at that. Others have preferred more elaborate skill systems such as those found in 2nd edition AD&D or the D&D Rules Cyclopedia. Traits serve as a bridge between these two preferences, and a set of automatic hooks to let the GM know what parts of a character’s past and present are most important to the hero. This talk of the thief class brings up questions of how Scarlet Heroes‘ class system is meant to overlay on top of another game. 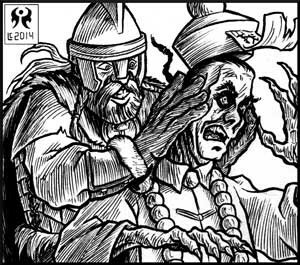 Next time, I’ll discuss ways in which the four classes provided by the game can be used as quick templates for more exotic professions- or how those professions can be brought in entirely to import new classes from other OSR games. One of my favorite parts of writing OSR material is the sheer flexibility of the framework. Fans of the genre might argue over which of our favorite systems does a particular thing better, or which rules might suit us best, but when it comes down to it there’s very little in the genre that can’t be made to work with all the rest. Any GM savvy enough to know that there’s a difference between B/X and AD&D is savvy enough to do conversions on the fly. People swap parts from different systems in and out without batting an eye. I kept this in mind when I was building Scarlet Heroes. The game is stand-alone and requires nothing but the 128-page core book for play, but it needs to be able to stretch. Let’s be honest- most of the people who might get this book already have a favorite system. They like that system and they’re going to keep playing that system. So what do I offer them that’s going to be useful, that’s going to really help them get more mileage out of the material they already have and love? I need to offer them an overlay, something they can lay down on top of their existing system to open up a fresh style of play. Scarlet Heroes relies mainly on reinterpreting standard old-school stats to produce a different play dynamic at the table. The most fundamental changes are in the way it treats damage differently for PCs and NPCs and the way in which it reads damage dice. In Scarlet Heroes, damage dice are rolled exactly as you would expect for an old-school game. Swords do 1d8, fireballs do Wizard-d6, dragon claws do 2d6, and so forth. Unlike in standard OSR games, however, the dice are read differently. A die that rolls a 1 does no damage, 2-5 inflicts one point, 6-9 inflicts two points, and 10 or more inflicts four points of damage. Thus, a 1d4 dagger might inflict 0 or 1 points, while a 1d10 polearm could inflict as many as 4 points. These points are subtracted from the hit points of PCs- and from the hit dice of NPCs. A mighty-thewed fighter who swings well with that polearm could do up to 4 hit dice of damage to his target, hewing down an ogre in a single stroke. Against a mob of enemies with comparable ACs, that same blow might lay out four common bandits, or a fistful of wretched kobolds. This damage differential turns even a 1st level PC into a fearsome engine of destruction. A 1st level fighter in Scarlet Heroes with 8 hit points can now endure eight blows from most weapons and every time he strikes he’s laying low at least one or two petty foes. Heroes can now handle the kind of combat situations that would normally require a party of several adventurers to survive, simply because they’re taking much less punishment and dishing out far more pain. Of course, this isn’t the only adjustment in Scarlet Heroes, and other tweaks such as the Fray die, heroic initiative, character traits, and Defying Death all combine to give a properly Conan-esque patina to any hero. But these adjustments all fit smoothly into the play of most other OSR systems. As the Kickstarter launch draws nearer, I’ll be talking more about these tweaks- and about the GM tools the book provides for generating the kind of excitement such heroes deserve. A Crimson Hour Draws Nigh…. After long months of unsleeping labor, Scarlet Heroes is almost ready for its impending Kickstart. 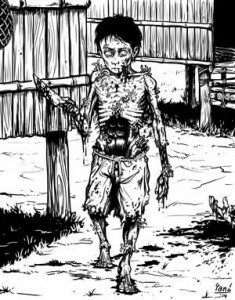 Once the last ten pages of layout is complete and the sure hand of Eric Lofgren has been given the cover art topic, the project will be sufficiently close to completion for a timely kickstart execution. So what is Scarlet Heroes? In brief, it’s a 128-page standalone RPG built to allow you to use classic OSR game material for single player/single GM gaming sessions. You can run this material with Scarlet Heroes or you can import certain mechanics from the game into your own favorite OSR system to allow for ultra-small-group sessions. So who needs Scarlet Heroes? If you’ve ever been in a situation where you wanted to show a friend some old-school gaming goodness or share the fun with your spouse or your kid, you know that it’s not always practical to get an entire group together to give them an intro session. Even when you have a standing group, sometimes only one or two of them can make it to the game, and you’ve already played out your boardgame collection. When these situations come to hand, just grab your copy of Scarlet Heroes, pick out your favorite classic module, and go from zero to gaming in five minutes flat. “But Kevin,” I hear you say, “being a canny, experienced, and extremely handsome GM of the sort that loves Sine Nomine products, I already have a large library of techniques for making solo-PC OSR games survivable!” And I’m sure you do. I’m sure I could hand you Keep on the Borderlands and you’d be able to figure out some way to make it survivable by a single 1st level B/X thief. But don’t you have more enjoyable uses for your time? Wouldn’t it be nice to be able to just grab some old-school content, call up a friend, and just game right there on the spot with no prep needed? Like so many of my other books, Scarlet Heroes works to give you the support you need to put your creativity and energy into the things that are most fun for you and your players. 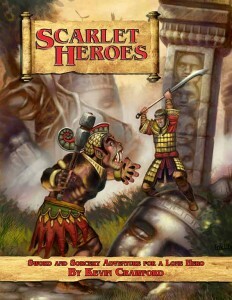 Scarlet Heroes is based on the Red Tide campaign setting, but is built to accommodate more traditional worlds. Save your pencil lead; use standard OSR attributes and statistics from existing products without needing to change numbers or adapt them to Scarlet Heroes rules. Relish a piping-hot bestiary focused on Southeast Asian monsters and foes. Why? Because not only does it fit with the Red Tide setting, you already have several thousand stat blocks for Euro-flavored enemies. You liked adventure tags in Stars Without Number? You liked them in Red Tide? Well have sixty more of them, divided between urban, wilderness, and dungeon tags. Rules and tools for 100% solo, GM-less adventuring, mixing your own creative interpretations with the tables to give your hero an adventure at any time- or help you build the framework for your own creations. Stay tuned. There’s more coming.